First and foremost its Home Cooked Heston’s first birthday! Its been a whole year of blogging and I have been loving every bit of it seeing the amount of people who like and view my blog on a daily basis makes me want to cook bigger and better recipes for you guys to follow and try for your selves. I have branched out to Instagram: @homecookedheston and also on Facebook. 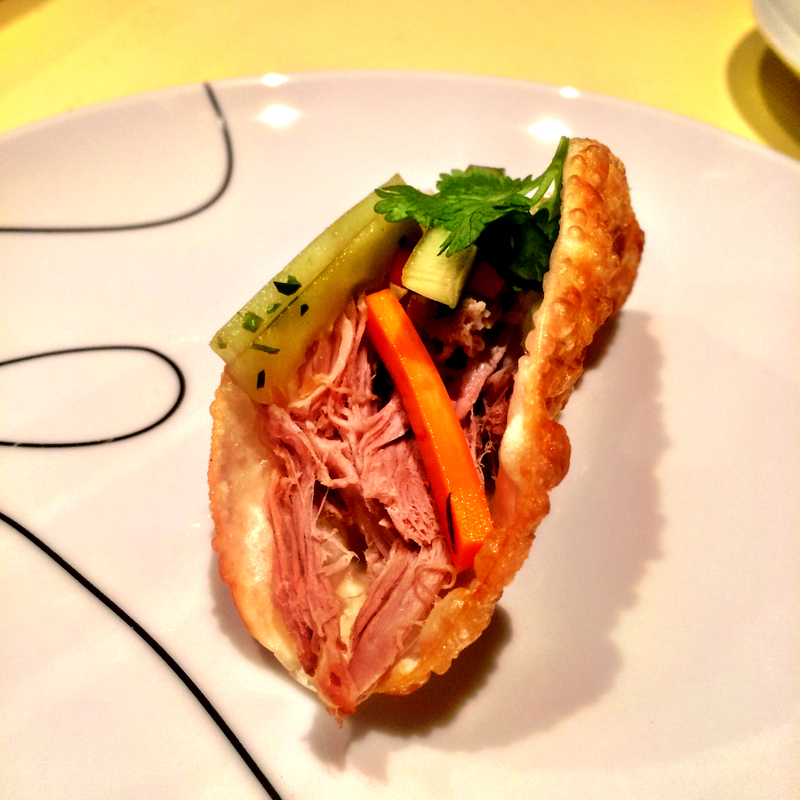 Now for the recipe to celebrate……Mini duck tacos with picked topping. 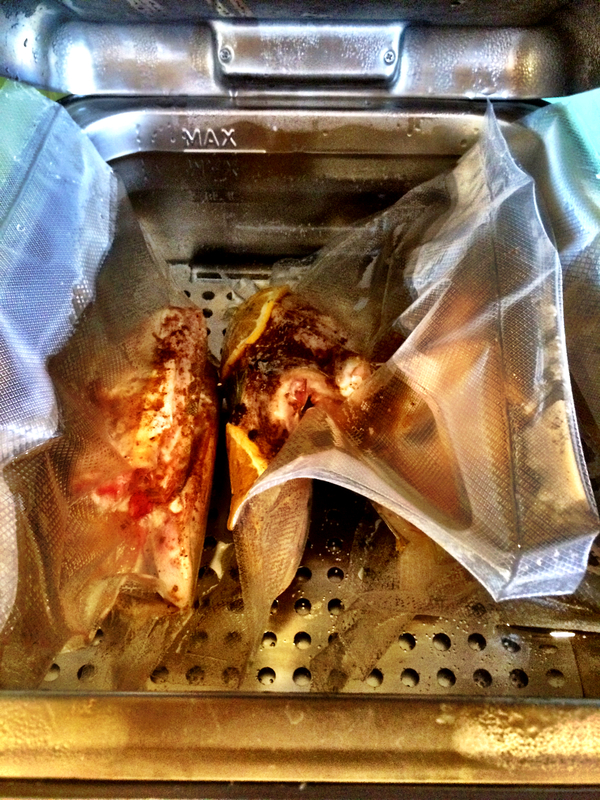 First set up the Sousvide and set to a temperature of 75ºC. Combine the salt, Chinese five spice and orange peel into a small bowl and mix to combine. 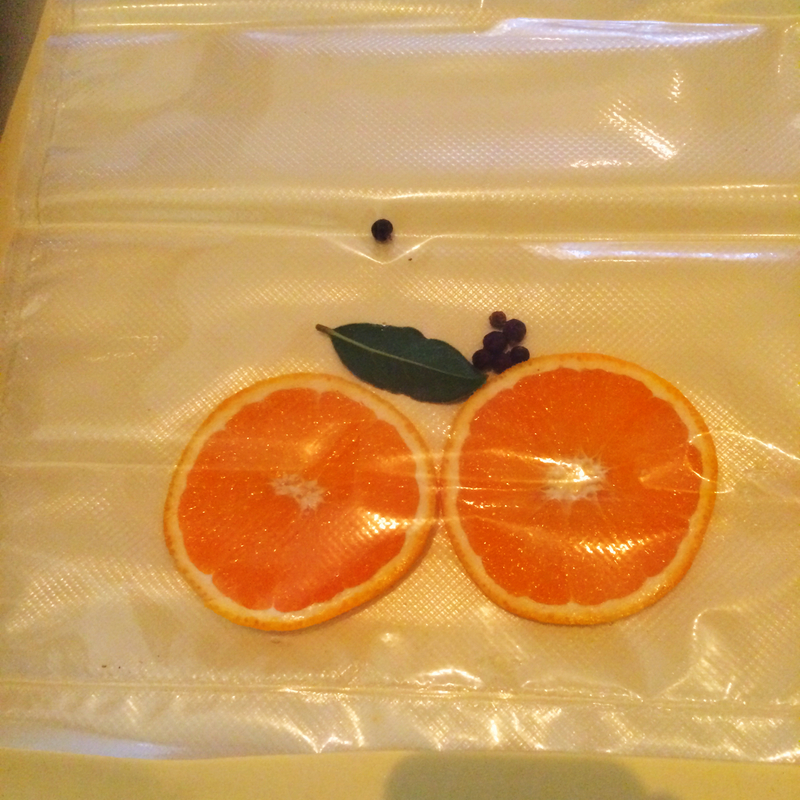 place the sliced orange bayleaf and juniper berries into a vacpack bag. 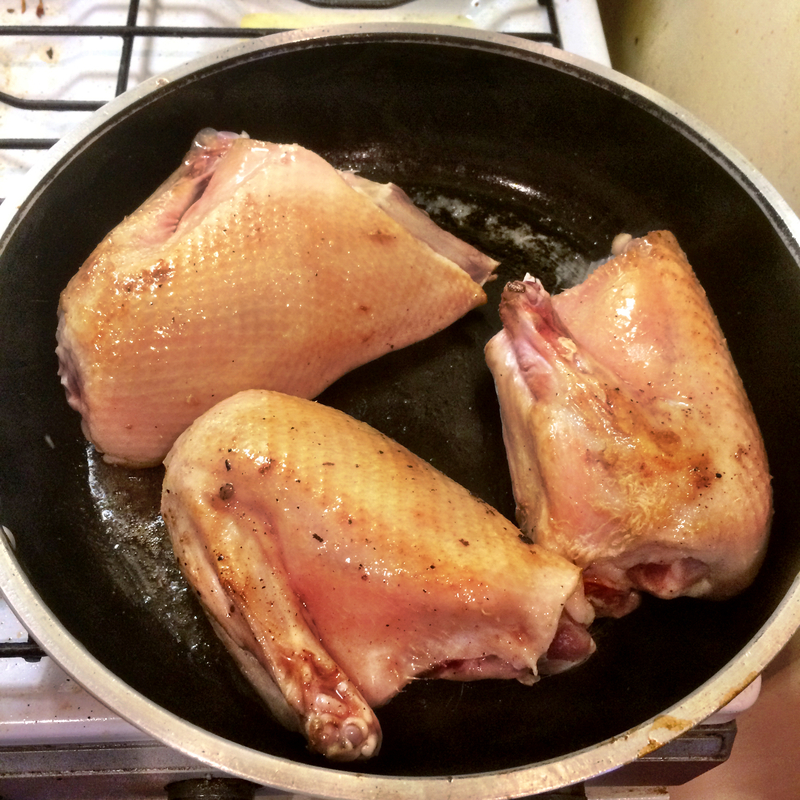 In a hot pan sear the duck skin until it turns golden brown then remove from the heat and place on a tray. Next you want to rub the seasoned salt into the skin and place into the vacpack bag and seal. 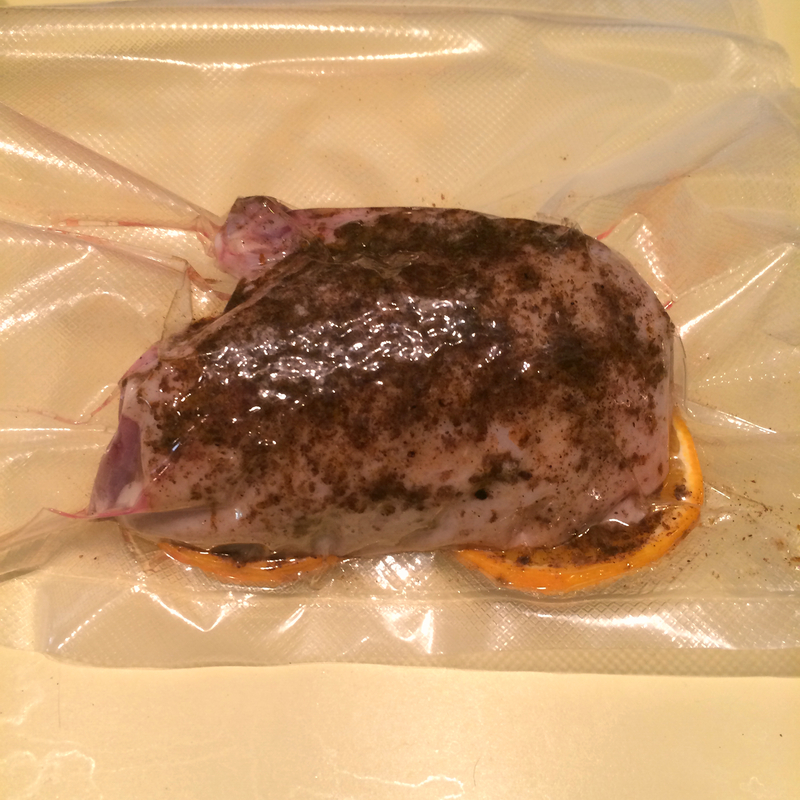 Place the vacpacked duck into the SousVide for a minimum of 8 hours. 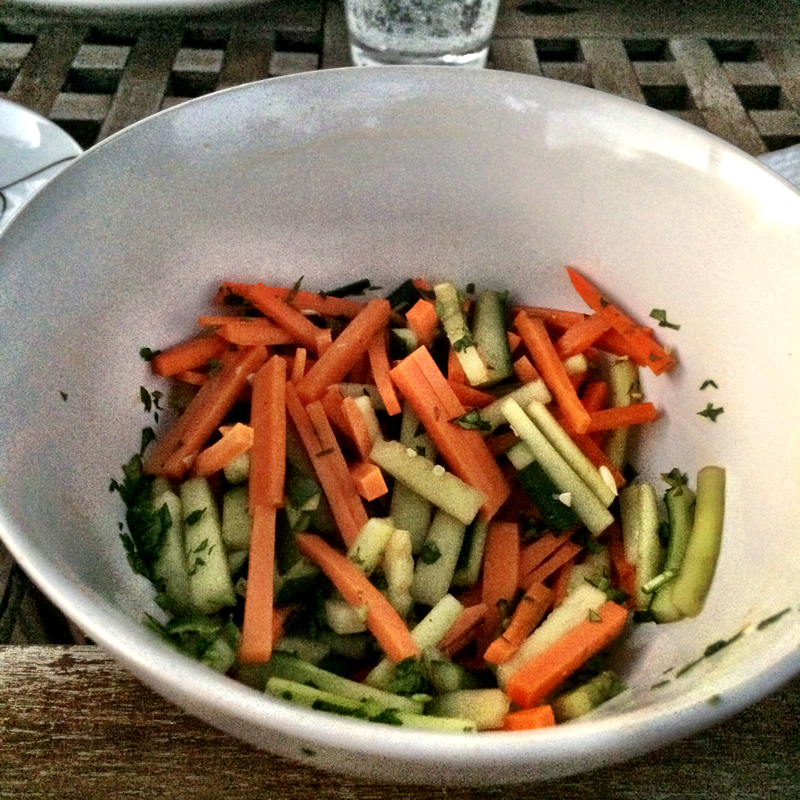 In the last half hour of cooking you want to Julienne the carrot and cucumber and place them and the coriander into a small bowl and coat with the vinegar. Place the sugar into the bowl and stir until dissolved, cover in plastic wrap and place in the fridge. Next in a small saucepan fill with about 3cm (1 inch) of your favourite frying oil. Next place one wonton wrapper on a spatula half on and tuck the other half under, folding in half. Dip into the oil for 10 seconds or until golden brown. Transfer to a plate, grab the side you just cooked with tongs and dip into the oil again. Leave on some paper towel to drain and repeat for as many tacos as you desire. 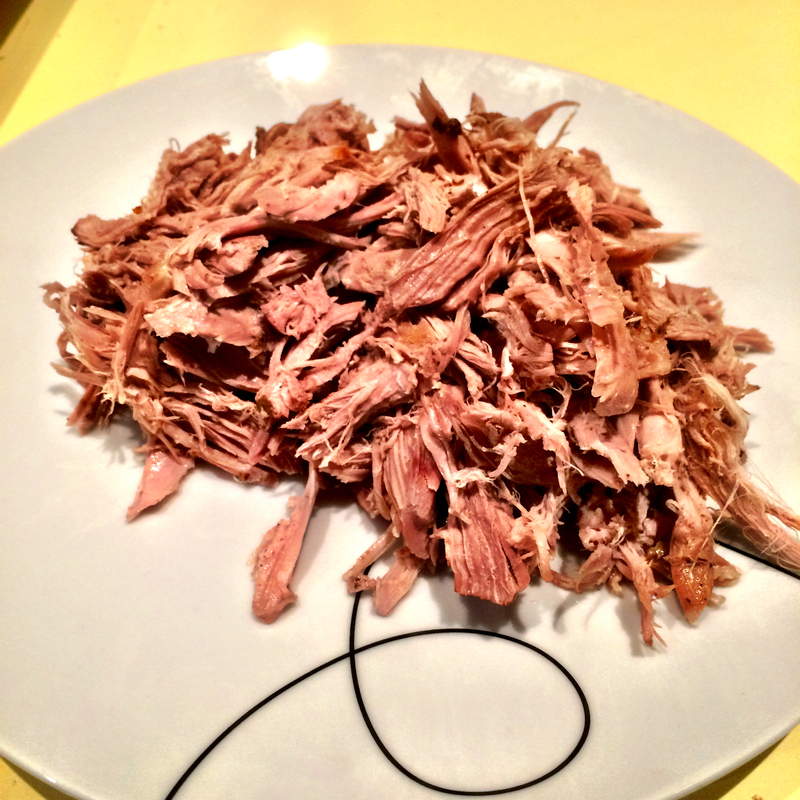 When the duck is ready remove from the vacpack bag and remove all the meat you can from the bones and shred with two forks. Drain the vinegar and discard. 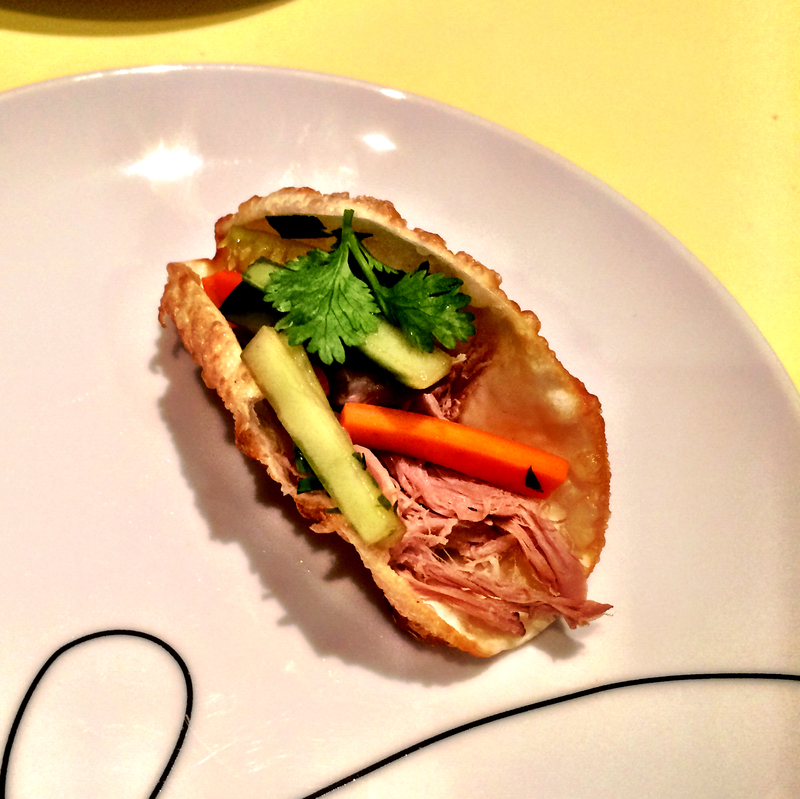 To assemble, place some pulled duck into the bottom of the taco shell and place some picked salad on top. To garnish finish with a coriander leaf and enjoy. 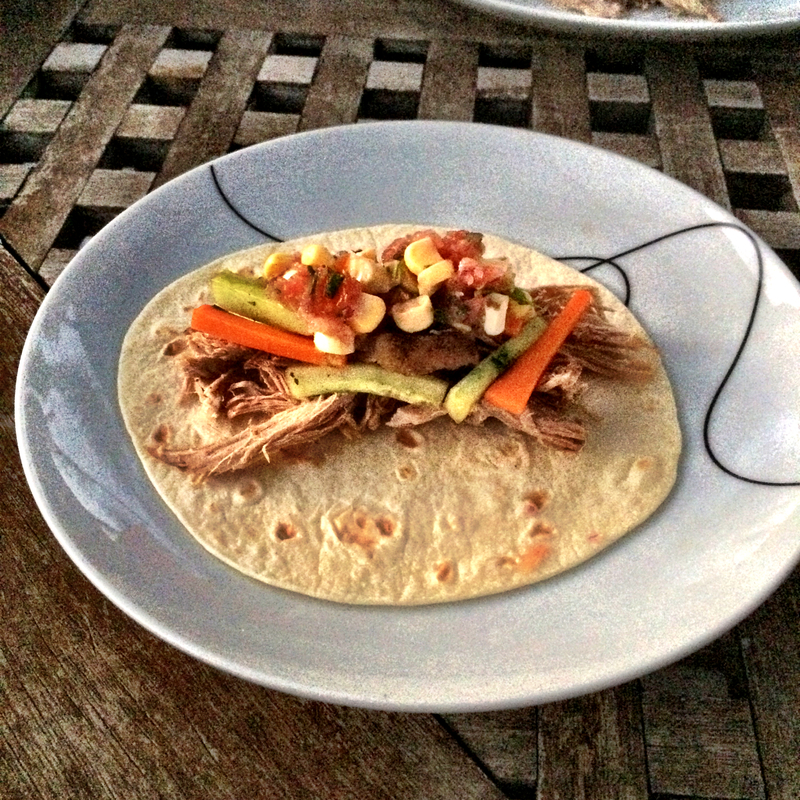 As I was cooking for three of us I decided to use some soft taco shells too to make it a bit more filling. Now I know this isn’t a very Heston like dish but this is one that takes me back to my childhood. When I was growing up in the small far north town of Exmouth in Western Australia we use to go camping quite a lot sometimes for weeks at a time. We would catch crayfish and fish by the limit load. 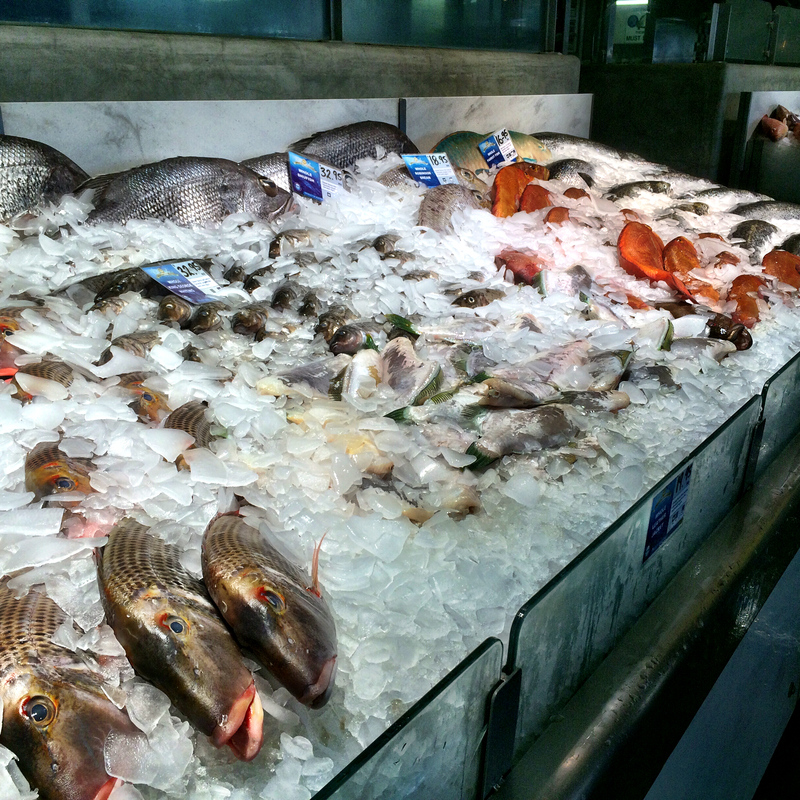 So why not use what you caught fresh that day and that’s exactly what we did. Lighting up a big fire and baking fish in the coals was perfect under a full star sky. Now I live in the big smoke of Perth, I still quite frequently go and buy a whole fish and prepare it the same way as my parents use to and have adapted that technique to use at home. 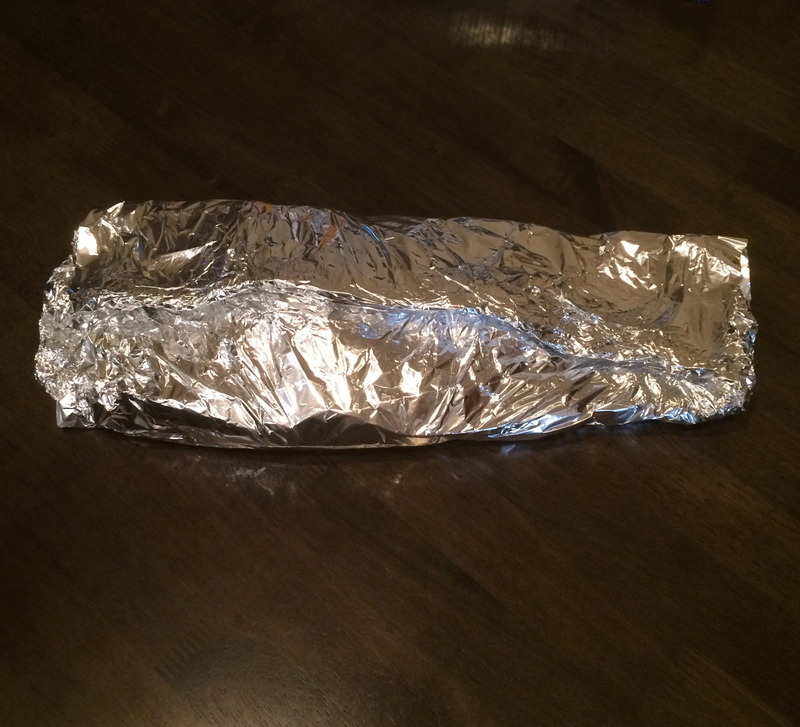 First preheat the oven to 180º and lay some aluminium foil out on a clean bench. 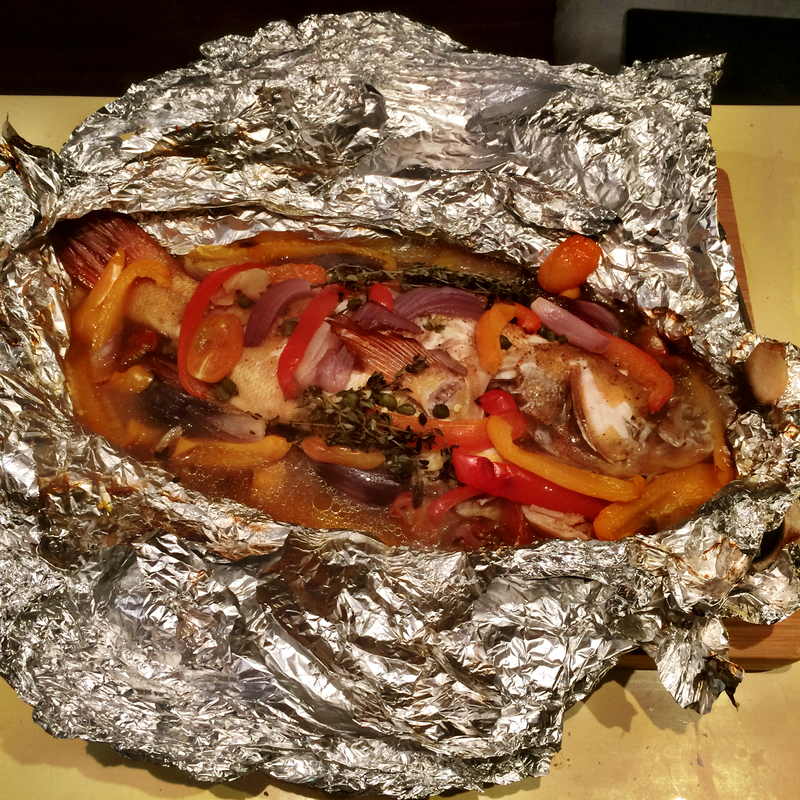 Give your fish a bit of a wash under some cold water and lay it on top of the foil. 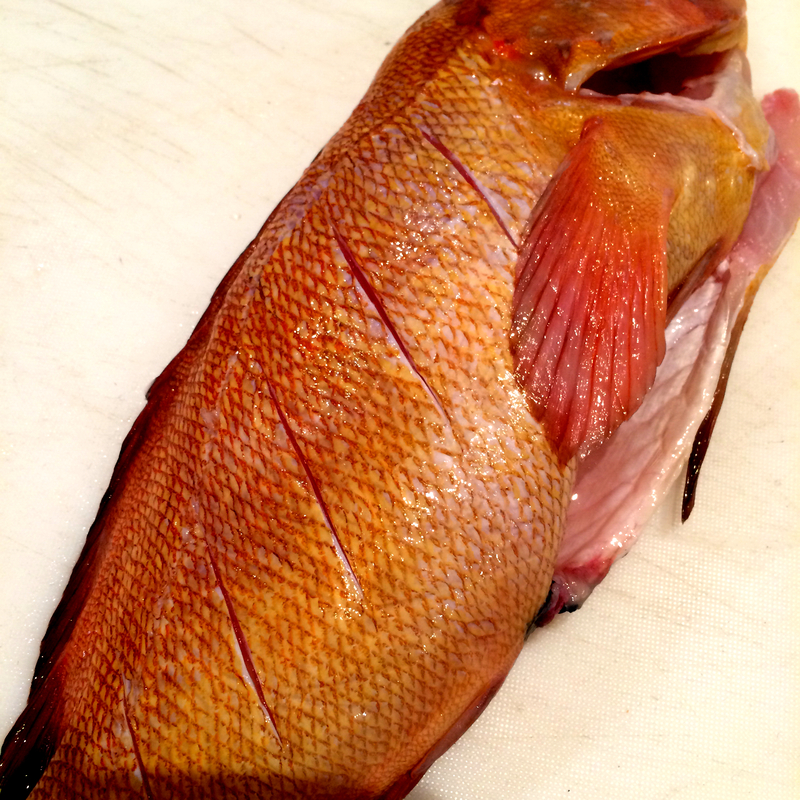 You then want to put a few shallow incisions into both sides of the fish (shown in the photo below). Rub the butter all over the skin of the fish and season with salt and pepper. Next you want to cut up your onions, capsicum, tomatoes and lemons into wedges and arrange them and the remaining of the ingredients underneath, in and on top of the fish. Once complete, wrap the foil up nice and tight to ensure that none of the juices escape while it is cooking (this is flavour). 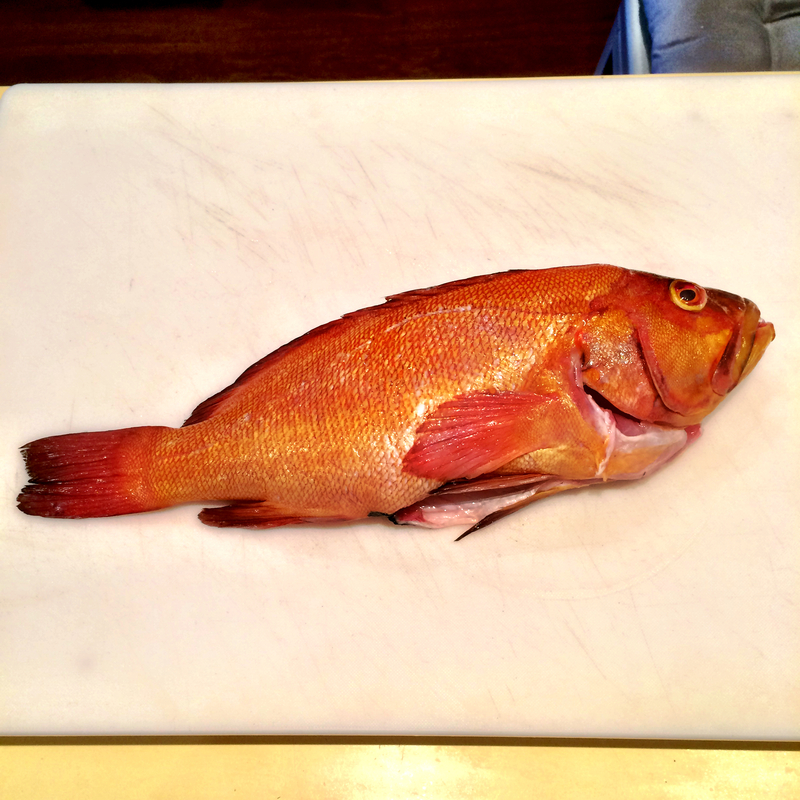 For a fish that will feed two people you want to leave it in the oven for 25 minutes before checking. Peel the foil back and with a night try to move a bit of the flesh from on of the incisions to see if you have the sam white cooked fish consistency all the way to the spine of the fish. 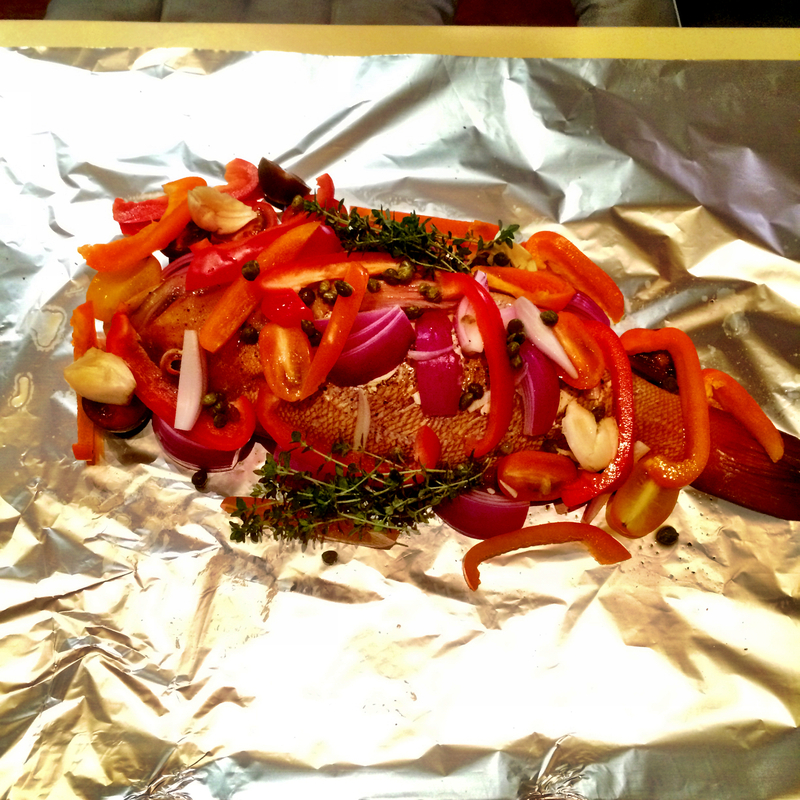 If this is the case you are ready to serve and if not place it back in the oven for 5 minutes at a time until cooked. Otherwise enjoy! If you were to do this on the open fire out camping, get you big bonfire cranking and git to down to some very hot coals. Make a well in the middle of the pit, place the fish in and cover back over with coals. 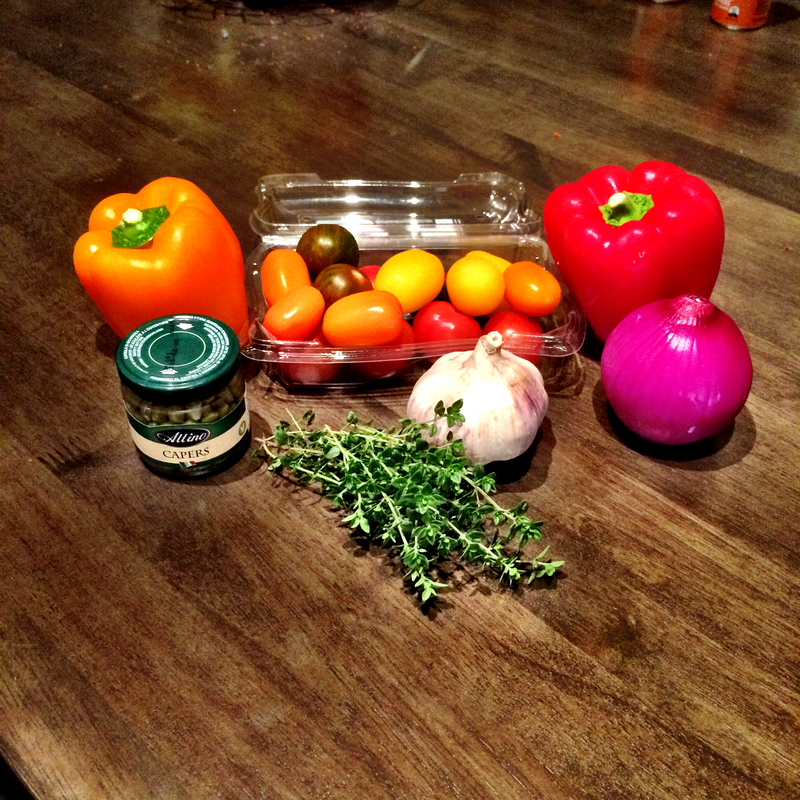 This is going to most probably be hotter than the oven so cook for 20 minutes and check. if it’s not cooked just place back on top of the coals for 5 minutes at a time until cooked through. The MANE Liquor boys recommend this dish be paired with the Bootleg Pils or for something a little more daring the Tilquin Gueuze Sour.